Drum roll please (and a sprinkle of drama). 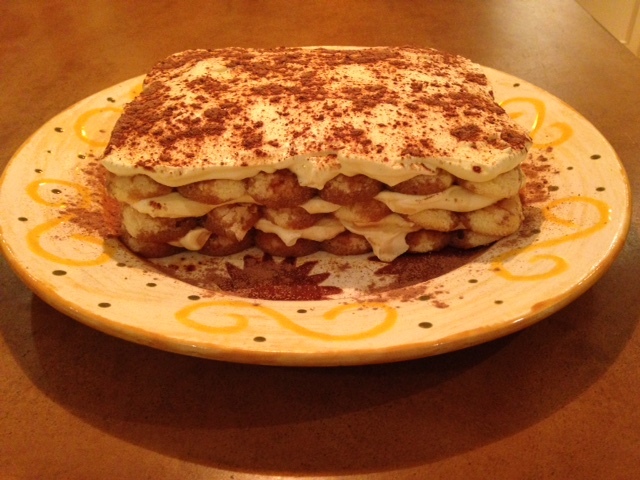 Back by popular demand, my famous Tiramisu! You will think you have died and gone to heaven once your mouth envelopes its first forkful and your taste buds swim in the soft textures. After careful consideration, I have decided to share my Tiramisu with the world. Why deprive people of this delectable dessert? Ten years ago, mia suocera gave me a recipe for tiramisu. I knew she was testing me. “Let’s see how well she handles herself in the kitchen”, she said to herself. After all, her son’s meals and well-being are now my responsibilities. One afternoon, she suggested we try the recipe. I was doomed! How can I possibly make an acceptable Italian dessert? She’s from Italy, for crying out loud. But I accepted her challenge. Studying the recipe and carefully placing the utensils within reach for quick access, I was ready. She stood by me the entire time…watching. Sweat beads forming around my hairline. I did it! Didn’t look half bad either. We tasted the finished product, it was good, but dull. I told her I will try again because I can improve upon some ingredients. A few weeks later, I gave it another go and the result was absolutely delicious! Today, la suocera calls me for the Tiramisu recipe (and others). This dish has been my contribution for many events; dinner parties, socials, fundraisers and school functions. Give it a try, compliments are sure to follow! repeat steps 4-6, up to 3 layers total. Thank you for the kind words, Arielle. Hope you try the recipe – it is very delicious!